William M. Yearby (July 24, 1944 – December 20, 2010) was an American football player. 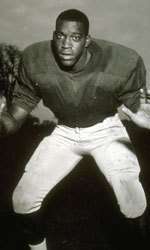 He played college football as a defensive lineman at the University of Michigan from 1963 to 1965 and was selected as an All-American in 1964 and 1965. He played professional football for the New York Jets of the American Football League in 1966. Yearby competes for Michigan's track and field team. Yearby was born in Birmingham, Alabama, in 1944. 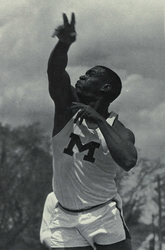 He moved to Detroit as a child and attended Detroit's Eastern High School, where he was the Class A state champion in the shot put in 1962. Yearby enrolled at the University of Michigan in 1962 and played college football for the Michigan Wolverines football team from 1963 to 1965. He was a member of the 1964 Michigan Wolverines football team that won the Big Ten Conference championship, played in the 1965 Rose Bowl, and was ranked #4 in the final AP Poll. He was selected by the Central Press Association, Football News, and Newspaper Enterprise Association as a first-team defensive tackle on the 1964 College Football All-America Team. As a senior, he was selected as a consensus All-American, and he was also named the Most Valuable Player on the 1965 Michigan Wolverines football team. Yearby was selected in the first round of the 1966 AFL Draft by the New York Jets. In December 1965, Time magazine described Yearby as "a vicious tackier, always on target, always gets his man — and not 5 yds. downfield, like most college kids." The following week, Time noted that "Jets Owner Sonny Werblin signed Michigan's 230-lb. Tackle Bill Yearby to a contract at $1,000 per pound." Yearby played only one season, 1966, for the Jets. The Jets' web site notes that Yearby "missed valuable training camp practice because of All-Star game and injury suffered in pre-season game," and that coaches at Michigan said he was "extremely quick" and could have been a starter on the Michigan basketball team. A terrific athlete, Yearby was projected to play tight end for the Jets. In 1966, a bad knee limited him to spot appearances as a fill-in defensive end and special-teamer. In 1967, Yearby's knee was still not right, and he was farmed out to the Bridgeport Knights of the Atlantic Coast Conference, who were the Jets' minor league affiliate. While playing linebacker for the Knights, Yearby hurt his knee again, and his pro football career was over. Yearby died in 2010 at age 66. ↑ Moyes, Jim and Bill Khan. "Boys Track and Field Individual Champions -- 1960-1969". Michigan High School Athletic Association. Retrieved 2007-11-27. ↑ "Michigan's Bowl History" (PDF). University of Michigan & Host Interactive. Retrieved 2007-12-31. ↑ "2014 NCAA Football Records: Consensus All-America Selections" (PDF). National Collegiate Athletic Association (NCAA). 2014. p. 7. Retrieved August 16, 2014. ↑ "University of Michigan Football All-American: William Yearby". The Regents of the University of Michigan. 2007-02-10. Retrieved 2007-11-27. ↑ "1965 Football Team". The Regents of the University of Michigan. 2007-03-31. Retrieved 2007-11-27. ↑ "Pick of the Pros (2 of 3)". Time. Time Inc. 1965-12-03. Retrieved 2007-11-27. ↑ "The Bonus Battle". Time. Time Inc. 1965-12-10. Retrieved 2007-11-27. ↑ "Bill Yearby - #88 - DT-DE - Michigan - Profile". New York Jets. Archived from the original on June 12, 2008. Retrieved 2007-11-27. ↑ "Jets Draft Ace Plays Dual Role". The Morning Call, Meriden, CT (AP story). August 9, 1966. p. 5. ↑ "More Mailbag". Sports Illustrated. Time Inc. 2006-08-25. Retrieved 2007-11-27.